Peanut butter is my treat! After workouts I have a PB&J sandwich! I LOVE IT! Good question. I am not sure. Depends on the brand I am sure. I am new to the blogging world, and I am just figuring this out. I really enjoy your blog, I look forward to continue reading it! I love Peanut butter on toast with a little sugar on it, yum!! Today is officially my FAVOURITE HOLIDAY. I don’t comment much, but I wanted to let you know how much I enjoy your blog. My wife, Lucy, has begun to ask me each day what the food of the day is. Thanks for providing this entertainment and interesting facts and history. 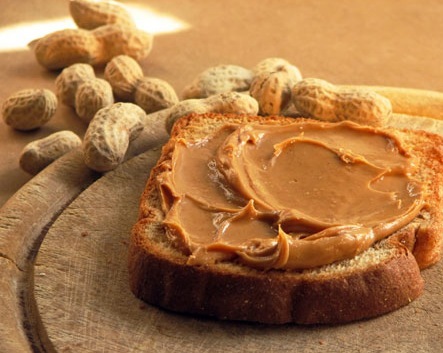 just toasted peanut butter lover’s day with a spoonful of the tasty stuff! i love to take a spoonful of peanut butter and a spoonful of nutella and shove ’em in my mouth. so good! fascinating as always and I have to say the watermelon achievement astounds me! i always put the peanut butter on before the jelly! That’s amazing, I would have thought that the US would account for more than 6% of the world’s crop of peanuts. They are everywhere in Georgia – particularly boiled ones. A fun post. Thank you! Peanut butter and bacon sandwich – Elvis’ favorite!! I <3 Peanut Butter. You should try Cookie Butter from Trader Joe's, your mouth will thank you. In celebration I shall carry my jar of peanut butter with me to class today. It’s college, not something unusual really. My weakness! Give me a jar of Peanut Butter and a spoon and I’m a very happy guy! Peanut butter such a comfort food. I eat it for snacks, breakfast and lunch and I am part of the 2% that puts the jelly on first..
Rum as a commodity! Now there’s a plan that was due to fail! As for PB, love the stuff. My local Max Brenner does a PB and chocolate smooth, so darn delicious!!! I’m curious about the other 4 percent who put the jam on first, then the peanut butter. That just doesn’t work. What a mess! I love peanut butter! Great Post! A p&j sandwich for lunch to celebrate today! I love peanut butter. My favourite would be Planters’ – creamy or crunchy doesn’t matter. Dunno if you can get that where you are. My Kiwi nephew has peanut butter/bananas sandwiches for breakfast every morning. Love all these bits of information you give us! I know someone in the sales side of food, and he was saying if people started farming peanuts in North America, there would be a real boon for them because apparently, the growing techniques in the East are very questionable at best… food for thought! Great day for us! Thanks for the info. I love peanut paste. I especially like peanut paste and jam sandwiches or fried peanut paste and banana sandwiches. Love peanut butter! Is it actually good for you, or is it just a myth? That fact about Iceland perhaps explains why so many Icelanders drink spirits. I had no idea there had been a beer ban there. I love peanut butter. We never had it back in Soviet times here. The first time I tried it, I hated it. I expected something very sweet and chocolate like. It took time to learn to love its flavour. Busymomhelp, that reminds me of a time when we had a girl from Belgium staying with us. She had never had pb & j sandwiches. I made one for her and she hated it. I couldn’t believe it! Must be an American thing.